Arsul grows wild in most parts of tropical India including the Andaman and Nicobar islands. It bears small shining dark purple fruits which taste good and are fondly eaten buy local people. 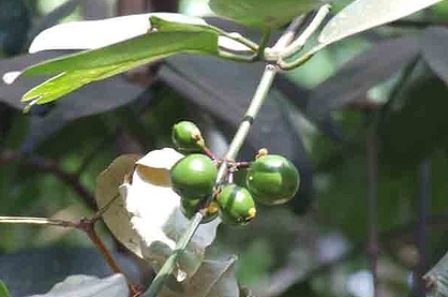 This fruit is also reported to grow in Ceylon and other islands in the Indian Ocean. An evergreen shrub or small tree, upto 5 m high and 45-60 cm in girth; bark grey, smooth, in vertical long, narrow strips. Leaves deep green, coriaceous, variable in shape and size, ovate-elliptic or lanceolate, acuminate, base acute, obtuse or cordate. Flowers white or greenish white, fragrant, in peduncled cymes. Fruit a drupe, globose, purple. The fruits are edible. On analysis these were found to contain, moisture, 46.0 g; fat, 0.3; fibre, 3.4 g; other carbohydrates, 43.3 g; calcium, 115 mg, phosphorus, 101 mg per 100 g of edible portion. The energy value was found to be 195 Kcal/100 g of pulp. 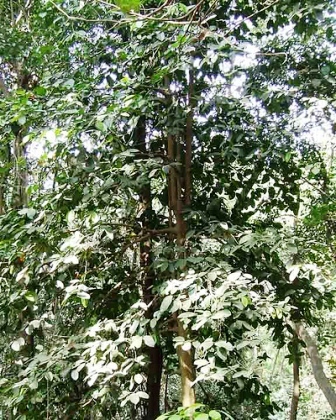 The stem bark and roots of arsul plant is used in Indian medicine against fevers and diarrhea. The wood is for making several turnery and other articles like toys, bowls, and agricultural implements. It is also used for making shuttles for silk industry.